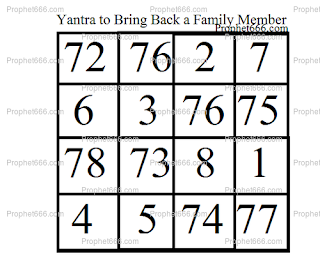 This Yantra, which is posted today works like a simple charm to recall back to the house any family member who has left the house or has gone and settled in another city or country. In this post, I have described the method of making and using this Yantra and the main principle behind its working. The Yantra should be drawn on a white colored piece of paper as shown in the image given below. Then the practitioner should keep it on the floor and spread some dust/mud/sand from the road in front of his house over the Yantra and whip it [a whip should be used for whipping the Yantra]. Success in this type of Yantra Experiment depends primarily upon the intensity with which the practitioner performs the paranormal experiment. The intense thoughts and desire of the practitioner in bringing back to the house the family member who has left the house is of paramount importance. By this kind of experiment the thoughts enter the atmosphere and work to fulfil the wish of the practitioner. This Yantra cannot be termed as a Vashikaran Yantra, even though the principles behind its working are essentially the same. To recall back a loved one or an ex-lover or spouse, you can refer to this post- Vashikaran Yantra to recall ex-lover. The Yantra is free from any kind of Tantra-Mantra, worship and energisation or infusion procedure. The Yantra can be prepared on any day and after the conclusion of the experiment can be disposed off in any manner. The Yantra Sadhana should not be misused for trivial purposes or just to get even with someone as it will not work or will rebound back upon the practitioner. I have published what is prescribed in this Tantra, the rest is left to you. Try with full faith, sometimes what happens is best for you and your future. 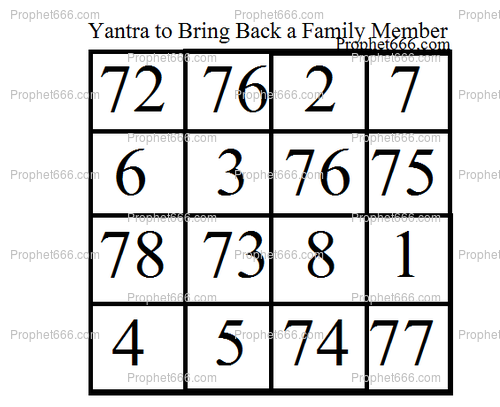 Yes, you can perform this or the other Yantra remedy to bring back your brother.